WOW! 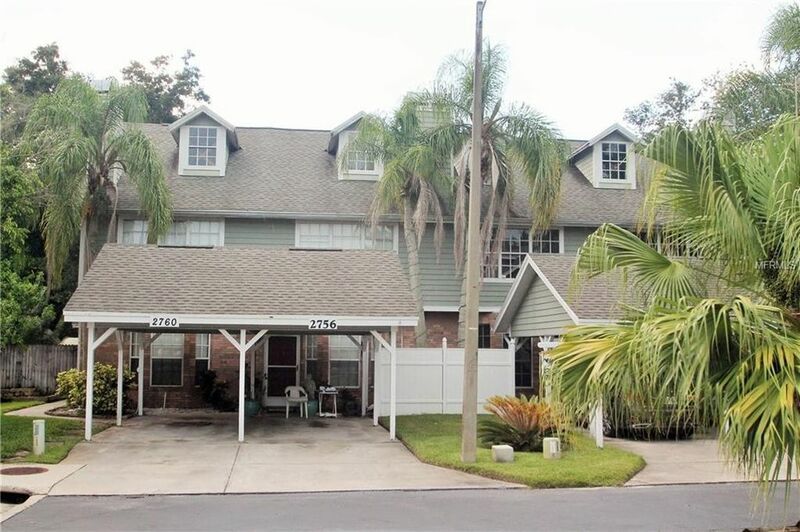 A 3 BEDROOM TOWNHOME IN THE HEART OF PALM HARBOR! STEP ONTO THE HARDWOOD FLOORS WHEN YOU WALK IN THE DOOR AND FEEL THE WARMTH OF THIS HOME. A WOOD BURNING FIREPLACE GRACES THE LIVING ROOM AND THERE IS PLENTY OF SPACE FOR ENTERTAINING WITH A LARGE SEPARATE DINING ROOM. THE KITCHEN IS VERY SPACIOUS WITH PLENTY OF CABINETS AND OFFERS ROOM FOR A DINING TABLE. THE LAUNDRY CLOSET OFF THE KITCHEN HOUSES A BARELY USED 2015 WASHER AND DRYER SET THAT CONVEYS. A NEW UP TO CODE ELECTRICAL PANEL WAS RECENTLY INSTALLED. THE A/C HAS BEEN SERVICED ANNUALLY AND KEEPS ELECTRICAL COSTS LOW. A CONVENIENT HALF BATH IS DOWNSTAIRS AND TWO MORE FULL BATHS UPSTAIRS. THE MASTER BATH HAS BEEN UPGRADED WITH A GLASS BLOCK OPEN SHOWER AND CHARMING CABINET STORAGE. TWO OUTSIDE DECKS OFFER A PEACEFUL RETREAT OVERLOOKING A WOODED AREA BEHIND THE HOME FROM EITHER THE SECOND-FLOOR MASTER OR THE GROUND LEVEL DECK OFF THE KITCHEN. LOTS OF ROOM FOR GRILLING OUT OR SIPPING COFFEE WHILE HEARING THE BIRDS SING OR WATCHING FOR DEER. YOUR PRIVATE CARPORT IS JUST OUTSIDE THE DOOR AND THE COMMUNITY POOL IS STEPS AWAY. THIS HOME IS CONVENIENT TO MANY SHOPPING AND DINING OPTIONS WITHOUT EVEN DRIVING ON US 19! SCHOOLS ARE 'A' RATED, AND INCLUDE SOUGHT AFTER PALM HARBOR UNIVERSITY HIGH!! AND LARGE PETS ARE WELCOME!! COME SEE THIS GORGEOUS TOWNHOME TODAY BEFORE ITS GONE! BETTER HURRY!! Directions: US 19 TO EAST ON NEBRASKA WHICH BECOMES WEST LAKE TO HAMBLE VILLAGE LN.